June 22, 2015, 4:28 p.m.
By Justin Ellis @JustinNXT June 22, 2015, 4:28 p.m. The Washington Post wants to make it easier to call on stringers to report from around the globe, and they’re taking a cue from Silicon Valley. The company debuted The Washington Post Talent Network today, a platform that is part social network and part job board, designed to make the process of hiring and deploying freelancers a lot easier. The talent network was designed to give all editors at the Post a universal system to identify writers for blogs, breaking news, or long features, across a variety of desks. While editors can post assignments to potential writers, freelancers can also use the system to pitch story ideas of their own to the paper. — Freelancer profiles, detailing professional experience and expertise and including work samples. Freelancers can import information from LinkedIn to save time and effort. — Story pitching, allowing freelancers to tailor ideas to every department and for individual editorial initiatives, including blogs. — Assignment posting, letting freelancers consider stories we wish to pursue. — Location tracking, ensuring editors know freelancers’ primary work locations, allowing quick deployment for breaking news. The system was the idea of Post associate editor Anne Kornblut, who developed the network during her time as a John S. Knight Journalism Fellow at Stanford. Part of her previous job at the Post involved the tricky task of wrangling freelancers, as Kornblut describes in a video introducing the network. “It can be really hard to find the right freelancer, especially during breaking news, tracking them down can be very difficult,” she says. The network was built by Jeremy Gilbert, the Post’s director of strategic initiatives, and engineers Greg Grieff and Jessica Witmer. Eva Rodriguez, a former Post reporter most recently at Politico, will oversee the network. I emailed Kornblut to find out more about the development of the talent network. Below she explains how the platform is a departure from their old freelancer system, and what the network owes to companies like TaskRabbit and Uber. Justin Ellis: How did this idea first come to life? Anne Kornblut: When I accepted the Knight Fellowship at Stanford, we cooked up a kind of unusual arrangement: having me work on a project very closely with the Post newsroom (versus doing independent work, which the fellows have traditionally done). Finessing the national desk’s freelance system had been on my to-do list as deputy national editor; Post executive editor Marty Baron had the idea of making it an even more ambitious project for the whole newsroom. After that, it was the dedicated efforts of a fantastic team within the Post — Jeremy Gilbert, Jessica Witmer, and Gregory Grieff — who built the platform, tested it and continue to improve it now. Ellis: In what ways does the talent network differ from or build off the Post’s current freelancer system? Kornblut: In terms of the technology, it is a completely new system, built from the ground up. Prior to this, each desk had its own way of working with freelancers. So, for instance, an editor on the national desk might be looking for a reporter in Reno, Nevada, and not know that someone in Style has one on speed dial. Now, those freelancers will be accessible to all the editors, and also better able to pitch stories across desks. Ellis: Give me an example of a story or scenario where an editor at the Post would put the network to use. Ellis: How does the freelancer payment system work? Kornblut: It’s the same as it has been, but integrated with the new system. Ellis: This reminds me in some ways of TaskRabbit. What ideas did you get from companies or tools that promote talent sharing? Kornblut: I did talk to an exec at TaskRabbit, as well as several others in the “talent-sharing economy” out here in Silicon Valley, about their workflow and the economics of finding and keeping quality freelancers. Mainly I wanted to get a feel for what is important at the highest levels. They all agreed that the trick is ensuring that freelancers feel part of a community that is doing good work — and that they have enough work to make it worth their while. Ellis: How does the Post plan to promote the network and grow its pool of freelancers? Kornblut: I think what you’re seeing today is the start of that. Eva Rodriguez is a terrific editor returning to the Post today to run the network, and she will recruit and vet applicants. POSTED June 22, 2015, 4:28 p.m.
Ellis, Justin. "The Washington Post built a social network for its freelancers to better match skills to stories." Nieman Journalism Lab. Nieman Foundation for Journalism at Harvard, 22 Jun. 2015. Web. 19 Apr. 2019. Ellis, Justin. "The Washington Post built a social network for its freelancers to better match skills to stories." Nieman Journalism Lab. Last modified June 22, 2015. 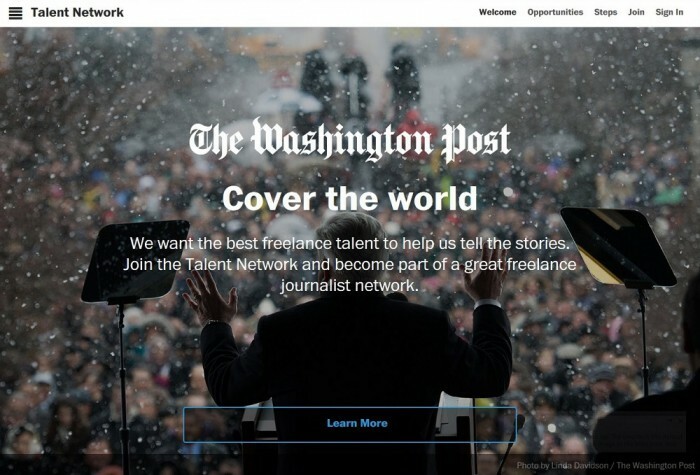 Accessed April 19, 2019. https://www.niemanlab.org/2015/06/the-washington-post-built-a-social-network-for-its-freelancers-to-better-match-skills-to-stories/.